On paper, the new Mahindra Alturas G4 has the specifications to go head to head with its body-on-frame rivals like the Endeavour and the Fortuner. But how does it compare to the unibody (monocoque) 7-seater SUVs in the market? We find out. The Mahindra Alturas G4 is the biggest SUV of the three in every proportion and by quite a margin. The Honda CR-V is the smallest of the trio in terms of length, width and wheelbase, although it is taller than the Kodiaq. Diesel - Since the Alturas G4 is available with a diesel engine only, we’re comparing it only with the diesel-powered CR-V. The Alturas G4 has the biggest engine with the highest power and torque figures. The CR-V has the smallest engine of the trio and also offers the least performance. The Kodiaq is available only in 4x4 variant while the other two cars are offered in both 4x2 and 4x4 variants. However, the Mahindra SUV’s body-on-frame design makes it the heaviest car here, the 4WD Alturas G4 being heavier than the AWD CR-V by 425kg and the Kodiaq by 351kg. This added weight could almost nullify the power advantage of the Alturas G4. Standard features: All three of these 7-seater SUVs are in the premium price category and therefore they offer a host of features as standard. The list of common features includes electric sunroof, driver seat with memory profile, mood lighting, cruise control and multiple AC vents for the rear rows of seats. Seating: The Honda CR-V is the only one of these three whose second row of seats slide and recline. The Mahinda Alturas G4’s middle row seats have a recline function but do not slide while the Skoda Kodiaq’s middle row slides and only offers a one-step recline. In the case of the Alturas G4 and the CR-V the middle row can be folded 60:40 split while the third row can be split folded 50:50 or put flat down for more boot space. The Kodiaq, however, does not allow split folding for the final row while the second row can be split folded 40:20:40. The front seats in the Skoda also offer 12-way adjustment with lumbar support. Safety: The Alturas G4 is tied with the Kodiaq for number of airbags (9), while the CR-V gets six airbags. Features like ABS with EBD, ISOFIX anchors, traction control and stability programs are common to all. However, the Skoda does not get hill descent control. Both the Kodiaq and the CR-V get rear-view camera functionality while the Skoda has parking sensors both front and back. The Alturas is a step ahead with its 360-degree surround view camera and front and rear parking sensors but it’s the Kodiaq that comes equipped with hands-free parking. Infotainment: Both the Alturas G4 and the Kodiaq offer an 8-inch touchscreen infotainment unit while the CR-V gets a 7-inch touchscreen. All of them feature smartphone compatibility via Android Auto and Apple CarPlay for various functionalities. The Mahindra SUV has a 6-speaker audio system, the CR-V has 8 while the Kodiaq has a 10-speaker setup. Comfort and Convenience features: The Mahindra Alturas G4 SUV is the only one here to offer ventilated seats in the front row. It’s also equipped with adjustable vents for the third row of seats, same as the Honda CR-V, and both offer dual-zone climate control as well. The Skoda Kodiaq only offers an adjustable AC vent for the middle row while offering three-zone climate control. The Alturas G4 also has a feature called ‘Easy access mode’ which moves the front seats back when you open the door for easier ingress. All these SUVs offer multiple 12V charging sockets while the Mahindra and the Skoda also offer an automatic electronic tailgate. 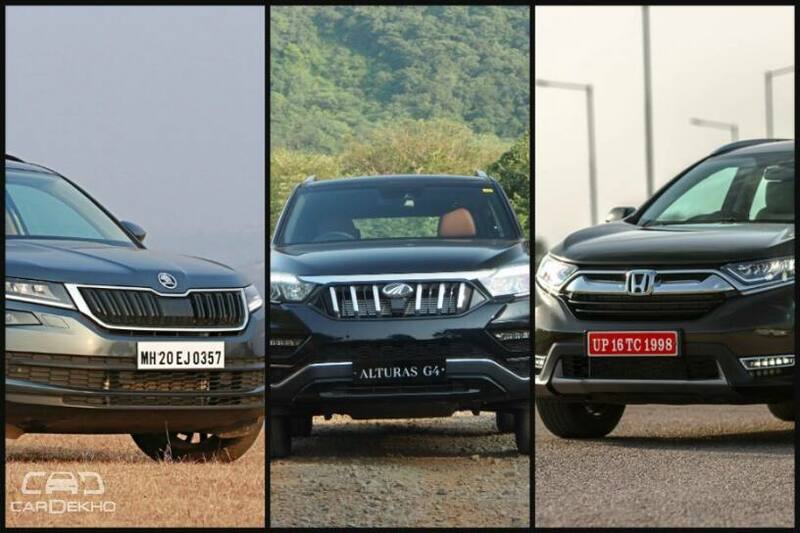 Mahindra is offering the Alturas G4 SUV at the lowest price while the Skoda Kodiaq is the most expensive car in this comparison. The Honda CR-V with its smaller engine and fewer features is still priced higher than the top-spec Alturas G4.